This training course follows the syllabus outlined by City and Guilds 2382-15 and teaches learners everything they need to know about understanding the IET Wiring Regulations. Incorporating the latest changes made under Amendment 3 of the Wiring Regs, the course is theory-based, taken over three days and is finished with an online exam at the end of the third day. All those wanting to work in, or currently working in, environments requiring 17th Edition qualifications will need to complete the City & Guilds 2382-15 17th Edition. As the 17th Edition is a basic qualification for most people wanting to work with electrics, it will allow progression to more advanced level electrical courses. Train with PASS at our 17th edition course Dundee and ensure you’re fully in compliance with the latest version of the IET Wiring Regulations! 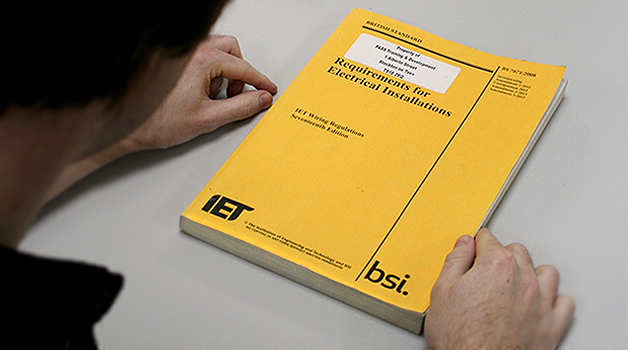 If you’re carrying out or involved with electrical work in the UK, it is required that you show you have full understanding of the Wiring Regulations and how to implement them as part of your work. This course gives you a full, City and Guilds accredited certificate in this discipline and the course’s content is in line with Amendment 3 of the Wiring Regulations, which became mandatory from 2015. This course is ideal for those in the Dundee area, including Newport-on-Tay, Tayport, Wormit, St Andrews and Tealing. It is a good idea to familiarise yourself with the IET Wiring Regulations book before attending this course. We recommend bringing this with you when you attend. Not got a copy? You can get one from us directly via our test equipment website, Tester.co.uk. Note: if you already have taken a 17th edition course previously that did not include the Amendment 3 changes, you are required to attend another course to ensure you’re up to date. We regularly also run workshops for those with previous experience – please call us directly for more information.